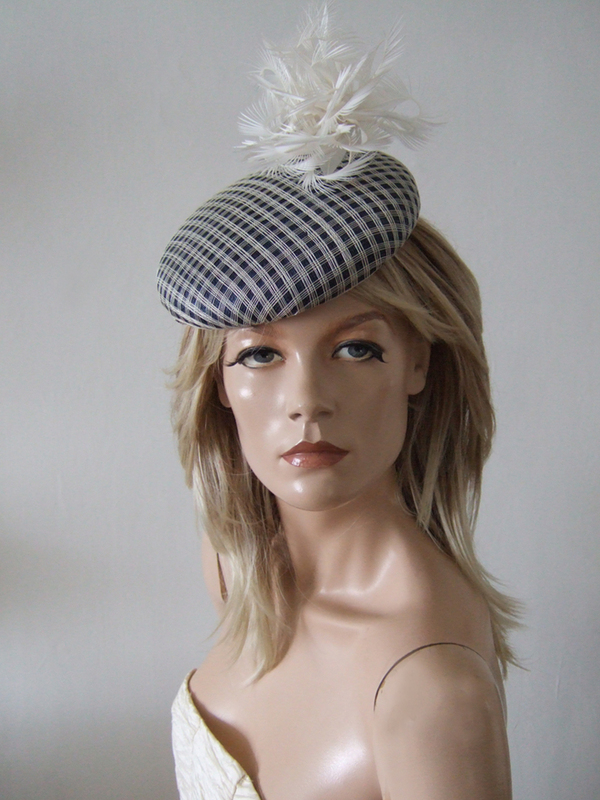 Modern Shape Smartie Headpiece from Contemporary Irish Milliner Aoife Harrison, in Navy sinamay, with White Lattice overlay. Dressed with a feather pom-pom of curled goose biots. A pretty headpiece for petite frames, or those that prefer cute to large..
£35.00 per day, plus £60.00 deposit refunded on return. Headpiece Measures 7.25" x 7.25". Height including feathers arrangement measures approx 5.5". Attaches using an elastic that you wrap around the back of head, under hair, holding the headpiece secure to your front right of your head.